Sandy beaches, high mountain adventure, memories (and selfies) make up our employee summer experience at Lake Tahoe. Why keep our favorite hot spots a secret? Here’s how Lake Tahoe Resort Hotel staff spend their time away from work. 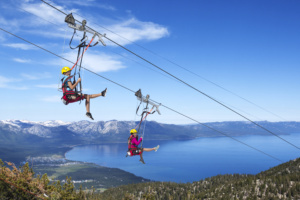 Heavenly gondola and zip rides: What better place for you to begin your sightseeing adventure than right outside our back door with a Gondola ride at Heavenly Mountain Resort. Summer operations continue daily with Gondola rides and the debut of the resort’s adventure course — a new four line Hot Shot Zip Line, as well the Discovery Forest Ropes Course and Boulder Cove Ropes Course, plus The Blue Streak Zip Line, Black Bear Ropes Course and summer tubing. Don’t forget your camera. The Heavenly Flyer zip line at Heavenly Mountain Resort, South Lake Tahoe, CA. Biking: Whether you like cruising along wide paths with other cyclists or soaring down the side of a mountain on a single-track, Tahoe South is crossed with an extensive network of on and off road bicycle trails. You can view the Lake Tahoe Bike Trail Map before arriving to better plan your adventure and check out more staff favorites on the My Tahoe mountain biking page. Hit the beach: In Lake Tahoe there’s no shortage of hidden coves and large public beaches nearby. Soak in the rays as you take in the panoramic views of the towering mountain peaks that surround the lake. Don’t forget the sunscreen and ice cold beverages to cool off or let us pack a picnic lunch for your day. Water adventure: Find that tranquil peace while paddling a kayak, discover your balance on a stand up paddleboard or skim the waves behind a ski boat or Jet Ski. There are several places around South Shore Lake Tahoe to find your ideal water craft for summer fun. Catch a big fish: Lake Tahoe has its share of sizable fish including the mackinaw lake trout that can be found shore side or by charter boat. These deep lake fish can weigh more than 30 pounds and are quite a thrill to catch. There are a number of charter outfits around South Lake Tahoe that offer mackinaw fishing packages. Guides are known for taking their passengers out to the sweetest spots, where guests can catch the big ones. If fly fishing is your game go to the My Tahoe fly fishing page for some ideas. Van Sickle Bi-State Park This hiking trail straddles the Nevada and California state line and is minutes from Lake Tahoe Resort Hotel for hiking with some great sightseeing views. The Tahoe Rim Trail: This is an extension of the 165-mile long-distance hiking trail which forms a loop around Lake Tahoe. The trail ranges in elevation from 6,240 feet at the outlet of Lake Tahoe to 10,338 feet at Relay Peak in Nevada. About 50 miles of trail above the lake’s west shore are also part of the much longer Pacific Crest Trail. Bring your camera, download some maps, and prepare to spend the day taking in Tahoe’s hidden gems. Echo Lakes: Many different hikes can be taken from this trailhead. For a short walk, hike to the far end of Upper Echo Lake. Many longer hike options are located farther down the trail. For a nominal fee, a boat taxi operated in the summer by Echo Lakes Resort and cuts three miles off your trip. Day hikers can pick up permits at the self-serve area at the trailhead. Fallen Leaf Lake: Hiking to Fallen Leaf Lake is best found just past the Fallen Leaf Campground. There are a number of well-maintained trails which all lead to the lake’s north shore with awesome views of Mt. Tallac. Being almost flat and from 3/4 to 2 miles round trip, it is a perfect hike for small children or older adults. The trail is wide and easily navigated with virtually no chance of getting lost. After reaching Fallen Leaf Lake, it is possible to extend the hike by taking a trail that leads first to the dam and then along a scenic stretch of Taylor Creek. Angora Lakes: An easy half-mile hike leads to two small lakes. Picturesque Upper Angora Lake is framed by cliffs and due to its shallowness it makes for a great swimming spot. Stop at the Angora Lookout on the drive up for a 360 degree view of the basin. Tallac: If you’re ready for a strenuous challenge, Mt. Tallac provides spectacular views of Fallen Leaf Lake, Lake Tahoe, and Desolation Wilderness. A wilderness permit is required. Weather conditions can change rapidly in the Sierra; bring a jacket, carry lots of water and allow plenty of time for your trip. Day hikers, pick up your permit at the self-serve area at the trailhead. 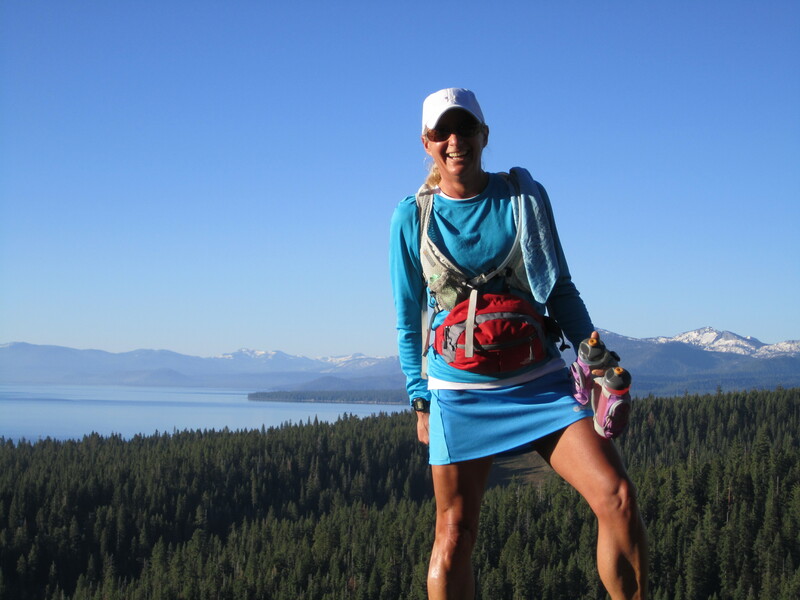 Find more suggestions at the My Tahoe hiking and running page. How will you adventure in Tahoe South during your stay at Lake Tahoe Resort Hotel?